October 2013–NEW YORK, NY— Cityzen by Azin redefines luxury with global consciousness. Azin Valy, co-founder of I-Beam Design, an award-winning architecture and design firm in New York, was inspired by research for an urban planning exhibition which her firm was nominated for at the Museum of Modern Art. Stunning views of cities from above evoked a sense of the diverse inhabitants sharing similar aspirations, providing the spark for Cityzen by Azin. Satellite imagery incorporated onto the finest silks, satins and leather reveals the intersection of the human body, nature and urbanism, creating a holistic fashion brand. Form following topography defines each garment by allowing a river to turn into a strap or a slit, a mountain creating a volumetric neckline, or a road marking a transition in a garment. Cityzen launched its 2013 collection at the San Francisco Bay Fashion Show this May, where Azin Valy exhibited her debut collection alongside other designers, including Marc Jacobs. Each of the fourteen cities represented in the collection is accompanied by a map that references points of interest such as architecture, the arts, food, music, local culture and a cause. 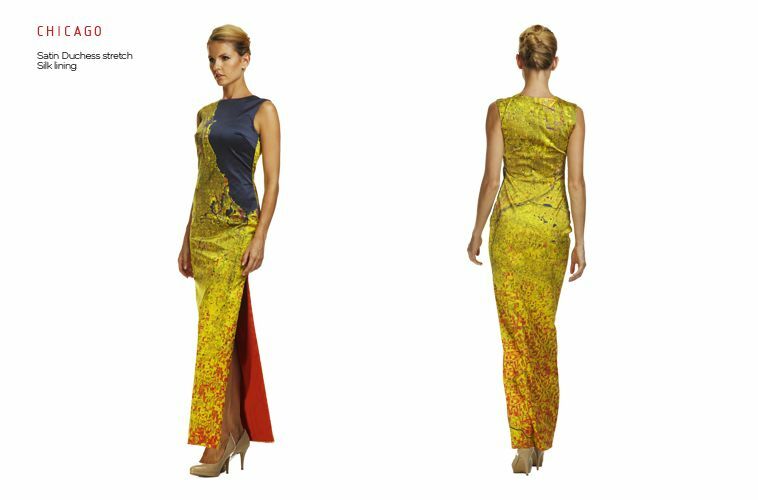 The Cityzen Chicago Dress is currently with Michelle Obama in the White House. Esperanza Spalding has worn Cityzen dresses on her world tour. The gowns have already graced the red carpet a few times by Shirin Neshat and Padma Lakshmi will be wearing our collection on next season’s Top Chef! Cityzen promotes global dialogue through fashion by transcending physical and mental borders.Cityzen believes that the arts can bridge differences, technology can reveal beauty, interconnectivity leads to new discoveries, and taking the long view brings commonality into focus. Her goal for the line is to inspire global consciousness by creating conversation pieces surrounding the topography of select cities. Cities highlighted by Azin’s aerial designs include: NYC, Los Angeles, Chicago, Paris, Dhaka, Bangkok, Tokyo, Cairo, Tehran, Baltimore and more.